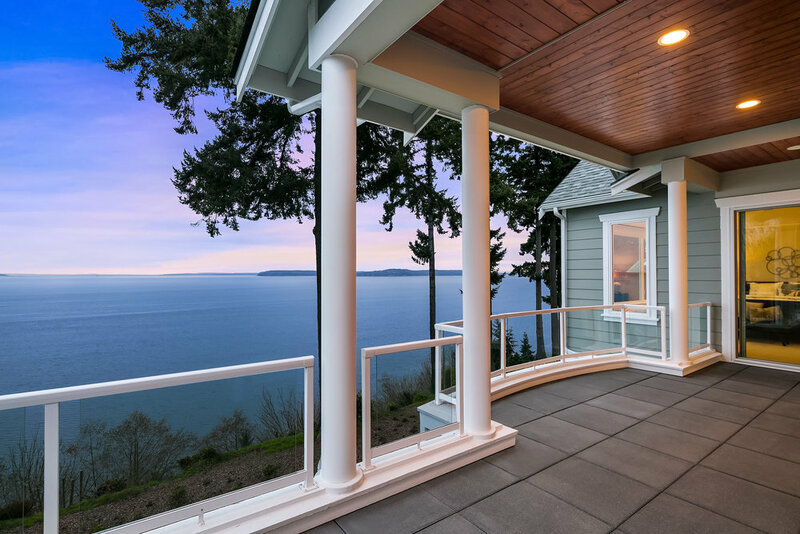 Situated in the secure and tranquil Vista Del Mar community just north of Edmonds, this elegantly proportioned residence offers a spectacular high bank waterfront location that captures singular views of Puget Sound, Whidbey Island and the Olympic Mountains beyond. With three bedrooms and three and a half baths spread over two stories, it offers plenty of room, while allowing for a penthouse-like single floor living experience in its opulently appointed and generously scaled main level. Enjoy the best of both worlds with the accessibility, security, low maintenance and stunning views of a condo coupled with the privacy, guest space and autonomy of a single-family home in this one-of-a-kind waterfront residence. 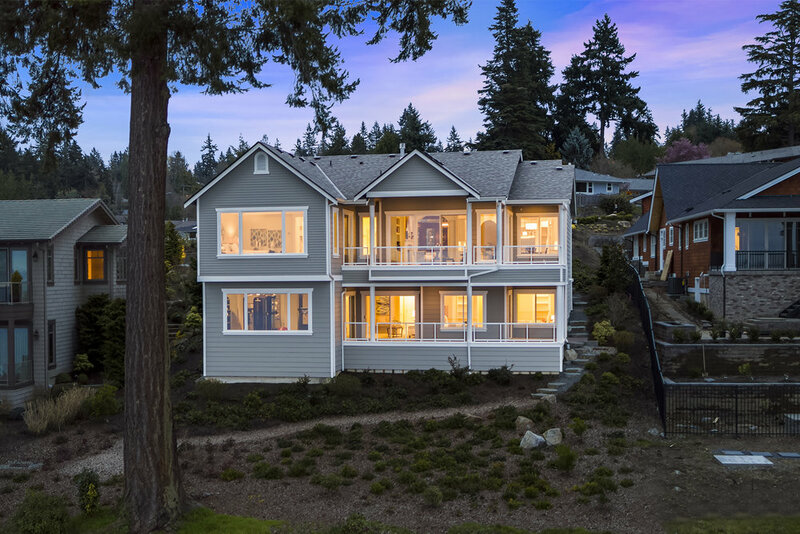 An elegantly restrained and traditional façade contrasts with Puget Sound waterfront views and perfectly scaled luxury living in this gorgeous home in the gated Vista Del Mar community. With a grand main floor master suite and two guest bedrooms on the lower level, this carefully planned and executed residence offers a classically timeless palette of finishes and details that compliments a contemporary space plan, optimized for single floor living and framing dramatic outlooks as works of art. A gracious drive curves down to the house, terminating in a generously scaled and landscaped approach that leads to the three car garage and welcomes guests to the main entry porch. A pair of columns creates a sense of occasion around the entrance, which opens into an expansive foyer that serves as the central artery of the home. From this landing, the dining room, living room, kitchen and office can easily be reached, with private hallways leading back to the master suite, utility and garage areas on either side. All areas of the house share ten-foot ceilings for an incredible sense of airiness and volume, with numerous skylights and oversized windows to flood rooms with natural light. The great room living area is in front of the foyer, offering a sightline directly from the entry out to the Puget Sound. Clean, crisp lines and refined details define the interiors of the home, including custom moldings, casework and built-ins, wide-plank hardwood floors and a selection of meticulously curated natural stone surfaces. The main level comprises a private home office, the opulently scaled master suite, a great room that is open to the gourmet kitchen, and a spacious formal dining area. In addition, a large powder room, several closets and a huge laundry room provide day-to-day convenience and storage, while extra-tall doorways and access points create a heightened sense of grandeur in every space. The foyer is a charming and light-filled room unto itself, offering a display alcove and ample space for occasional seating. It is the perfect gathering portal for casual and formal entertaining, and provides a restful and easy flowing entry to the home. To the immediate right of the foyer, a pair of etched glass doors separates the home office and den from the rest of the house. 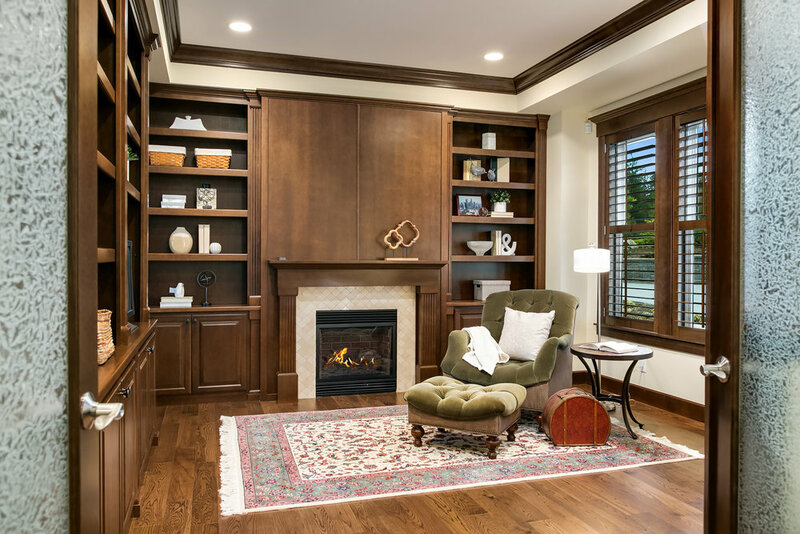 This is a wonderful hub from which to conduct business or for use as a library, offering walls of custom bookcases and a built-in corner desk area, all warmed by a central gas fireplace surrounded by a paneled wall and set into a mantel tiled in natural stone. 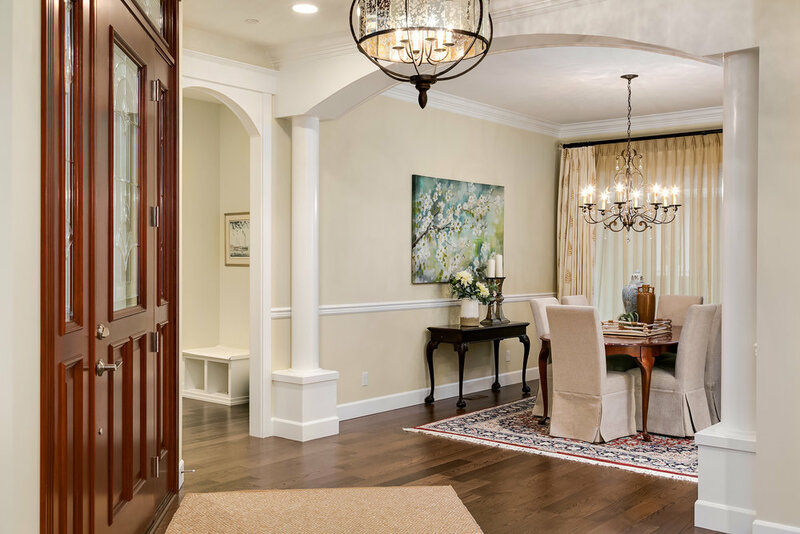 Details abound in this warm and inviting enclave, including columns surrounding the desk, deep crown molding and raised panel doors on all of the cabinetry. A spacious powder room with a wide vanity sits conveniently across the hall that leads through an arched, columned passage into the living room. The living room is a sublimely tranquil space, surrounded by two walls of windows and opening out onto a covered wraparound deck through a pair of sliding doors. 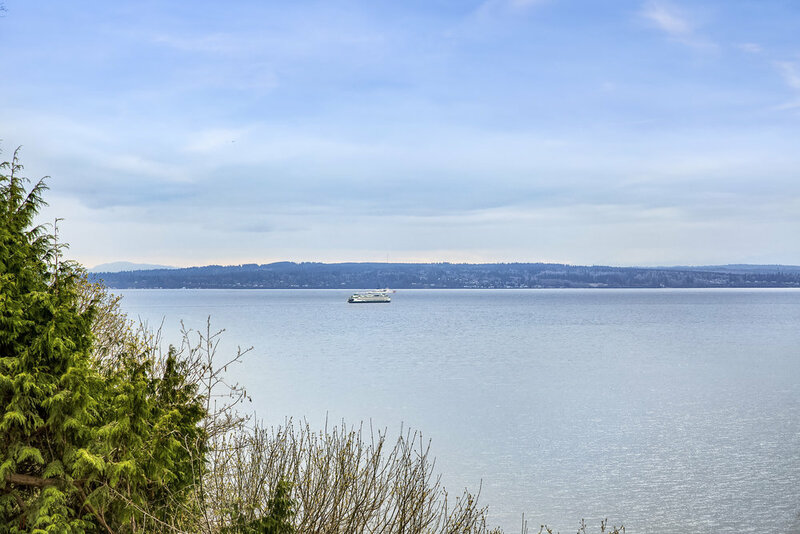 This is the ideal perch from which to keep an eye on the two resident bald eagles that the property supports, and it gives spectacular views of the shipping traffic on Puget Sound as it crosses between the mainland and Whidbey Island. The room is anchored by a gas fireplace set into a formal, stone-clad mantel and surrounded by a wall of custom built-ins for storage and display. 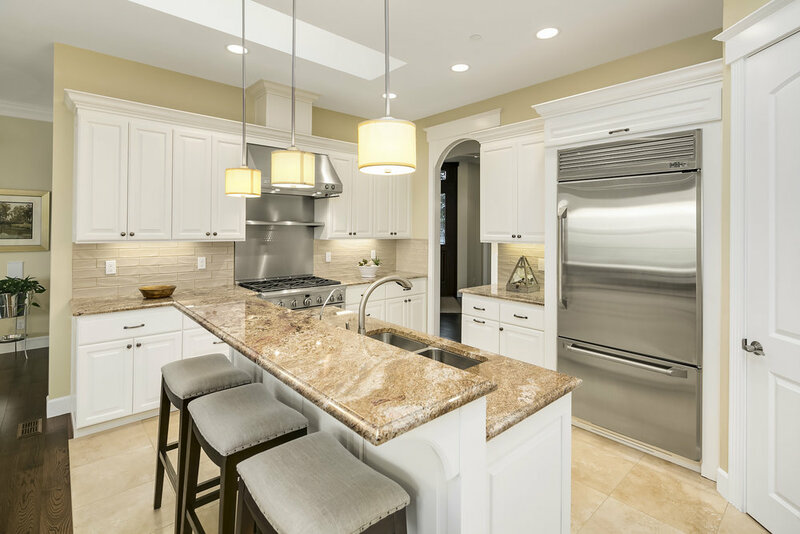 A gourmet kitchen with elegant white enameled cabinetry connects seamlessly to the living and casual dining areas and functions as the hub of the home. It includes a suite of high-performance GE Monogram appliances that includes an industrial style 36 inch gas range, built-in refrigeration and a walk-in pantry with slab granite counters and hand-made tile backsplashes that coordinate beautifully with large-format crema marfil floors. A pair of skylights provides natural illumination and indirect sun, while a giant window frames more views over the high bank waterfront. 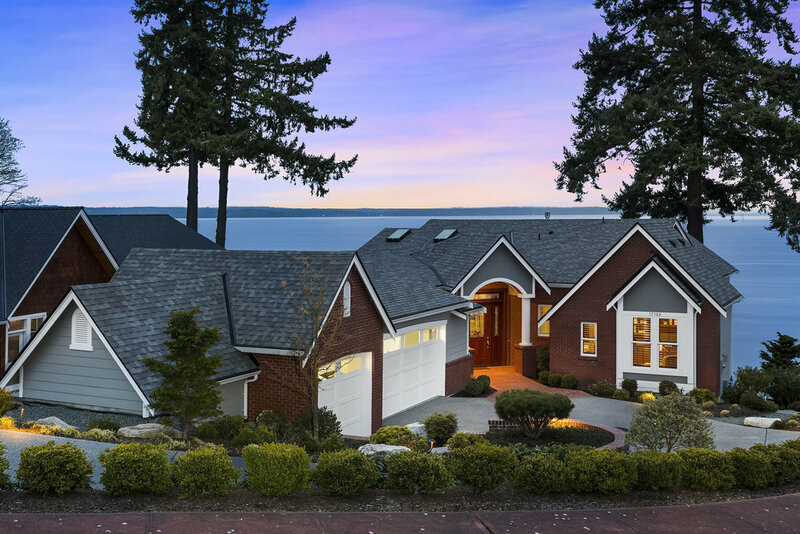 The paved deck off the back of the house is accessible from both the living room and master suite, and affords a 180 degree view over the Puget Sound waterfront and Whidbey Island, all the way to the Olympic Mountains in the background. This is a staggering and unobstructable view that is always dynamic, allowing engagement with wildlife, sea traffic and the ever-changing weather. With deep overhangs and recessed lighting, this special area offers year-round enjoyment of nature, day or night. A spacious dining room is entered through a wide arched passage with columns on either side, and a huge picture window on the opposite end. The space can easily fit a table for eight with plenty of room for expansion. Deep crown moldings help to further define the room.. 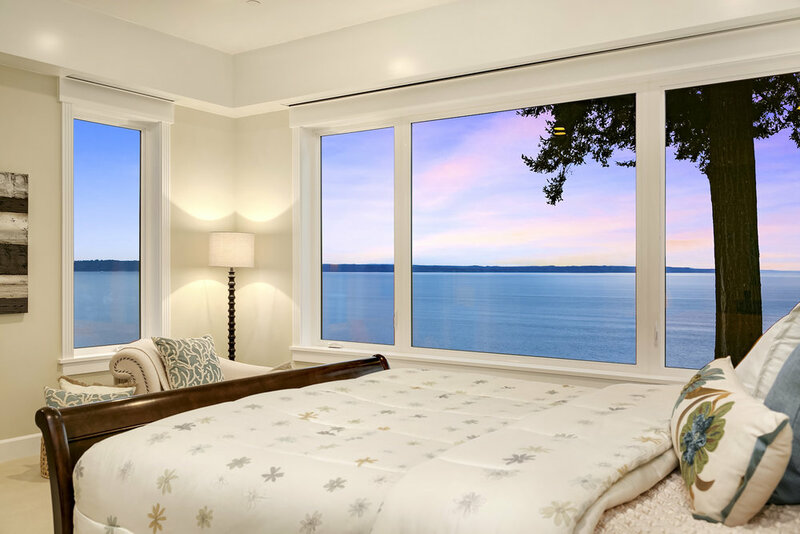 The master suite shares in the breathtaking views, and includes a walk-in closet and luxurious five-piece master bath. It is large enough in scale to allow for a comfortable seating area, yet still maintain an intimate sensibility that helps focus attention on the restful water views in two directions. The bath includes individual vanities with slab granite counters, a deep soaking tub and a grand, two-person glass shower with a pebble floor. The heated floors are tiled in a complimentary hex tile, and all fixtures are finished in brushed nickel. The closet includes a full set of built-ins and is scaled to function as a dressing room. The staircase opens into a central hall that leads to a casual seating area and two guest bedrooms that share a bath. This is the perfect area for visitors, multi-generational families or even live-in help, offering privacy and detachment from the main floor, as well as a great sense of autonomy and tranquility. Just past the office, an elegant staircase leads down to the lower level, an additional full floor of living space with high ceilings, huge view windows and a large patio overlooking the Sound. The staircase opens into a central hall that leads to a workout room with its own dedicated bath, a fully finished and conditioned storage room. The exercise room offers majestic views over Puget Sound, as well as shock-absorbing rubber flooring, two walls of mirrors and direct access to the patio. 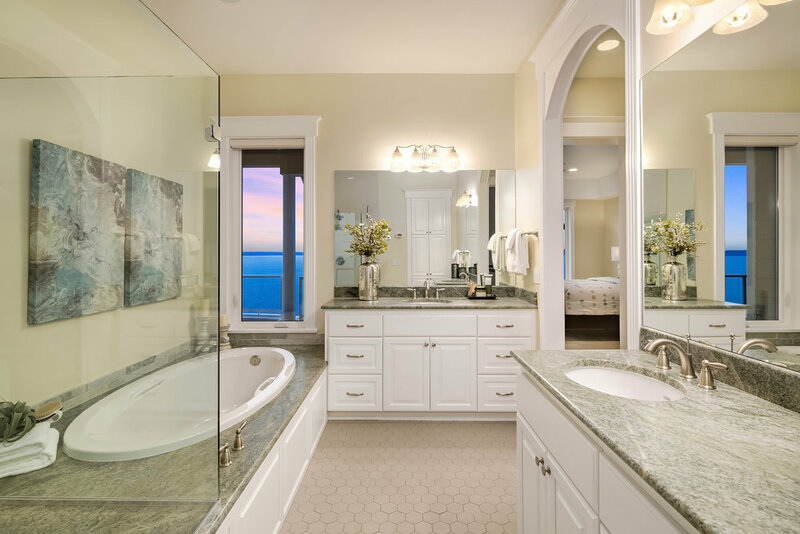 It also includes a full bath with tile floors and granite counters that allows the space to be easily reconfigured into an additional bedroom suite. The lower level den is a delightful and light-filled perch for relaxing in front of the TV, or simply enjoying the view. It opens onto the back patio through a set of sliding glass doors, making it a great area for indoor/outdoor enjoyment and recreation. Two guest bedrooms share access to a corner patio and are located just across the hall from a spacious full bath. Vista Del Mar lies just north of Edmonds, Washington, a delightful town along the shores of Puget Sound that offers easy access to Seattle and the Eastside, while preserving a small town, Main Street sensibility. Edmonds maintains a wide range of urban amenities, from diverse shopping and dining to entertainment and recreation, but presents them in a walkable, historic setting that invites a tremendous sense of community and neighborly involvement. It is an idyllic city by the sea that is surrounded by carefully preserved natural beauty, and which acts as the main point of departure for all that Whidbey Island has to offer. This is a very thoughtfully laid out home that is ideal for those seeking a luxurious single floor lifestyle with the option of a largely autonomous second level for guests, storage or hobbies. It offers a voluminous and opulent main level that is reminiscent of a penthouse in its scale and flow, while also affording a more casual range of spaces that can easily be kept dormant until needed. With the security of controlled access entry to the Vista Del Mar community, coupled with low maintenance landscaping and stunning views, this residence represents an exceptionally gracious condominium alternative for people considering downsizing, but for whom shared walls and common spaces are not appealing.